San Diego's Balboa Park is close to home (15 minutes) and full of all sorts of things to do - but we don't manage to get down there very often. 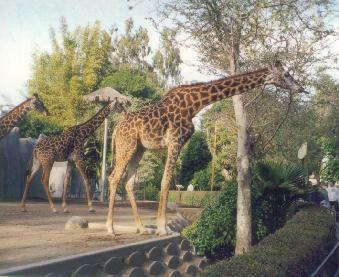 The San Diego Zoo is there, as well as several museums, the Space Theater, lots of gardens, an outdoor theater, and picnicking and play areas. The park is 1400 acres right in the middle of the city. 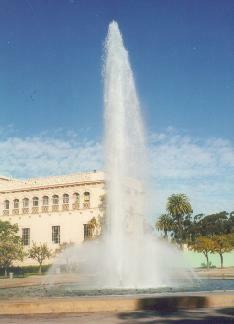 Most of the buildings were constructed in 1915, when San Diego was competing to host the Panama-Californa Exposition (San Francisco was chosen), but additional buildings were built when San Diego was chosen to host the 1935 California Pacific International Exposition. The Spanish Colonial architecture features a lot of highly decorative "gingerbread" trim, and as the buildings have been renovated in recent years, these features have been carefully preserved. 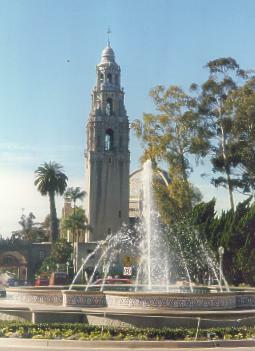 The bell tower of the Museum of Man (pictured here) is one of the park's most recognized features, and you can hear the bells chime the half hours from almost anywhere in the park. We parked the car and went to the Reuben H. Fleet Science Center (yeah, that's the official name now, but it will always be the "Space Theater" to me! :-) ). 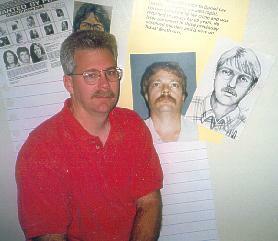 We hadn't been here in several years, and they have been doing a lot of remodeling. The "Science Center" has been completely redone and expanded, and they've added a motion simulator ride called "Sci Tours". We were there not too long after it opened, and bought the "Complete Package", which included the 11:00 IMAX film, access to all the exhibits, and a ride on the simulator. The IMAX film we saw was called "Mysteries of Egypt". We decided that all IMAX films HAVE to have a disorienting flying scene...and this one was along the Nile River. :-) Omar Sharif played the grandfather telling his granddaughter about the pyramids and tombs and other landmarks of ancient Egypt. The scenery was good, but I found the "plot" a bit tedious. We did Sci Tours after seeing the movie - the premise is that you're on a Mission to Mars to save the Martian colonists. After we got off, Lee pronounced it the tamest motion simulator he's ever been on. It's still pretty well done, though - but we've probably been a bit spoiled by Disney. We wandered through the rest of the Science Center exhibits - and watched the Verrazano Narrows bridge fall down, among other things. We were glad we'd gotten there early, because things were starting to get a lot busier. It was past lunchtime, and we'd decided to eat at the Zoo, but we wandered around the park a little bit first. 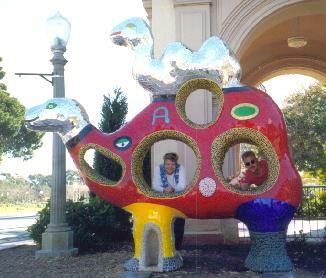 There were some, umm...*different* looking animal/sculptures done by Nikki St. Phalle... I know some people consider it great art, but it always looks like a kid's papier-mache project to me. We wandered through Spanish Village, which is an Arts and Crafts center full of studios for local artists - featuring painters, woodworkers, potters, etc. The only zoos I've been to are the San Diego Zoo and the National Zoo in Washington D.C., so I know I've been spoiled by seeing the creme de la creme. The San Diego Zoo has been upgrading a lot in recent years, and constructing "habitats" rather than relatively boring enclosures. It's much more interesting to see the animals in a setting that approaches their natural environment. Though the animals tend to throw the designers some curves - when they opened up Sun Bear Forest several years ago, the sun bears came in and ripped up all the grass and did quite a number on the trees. Whoops...the exhibit closed until they could re-think things and make them a little more "sun bear-proof". Our first goal was to find food...we got sandwiches and chili at the Treehouse Cafe. Nothing to rave about, but it was ok. The Treehouse is near the Gorilla Tropics area, and we walked past the lowland gorillas - the big silverback was walking around getting lots of "oohs" and "ahhs", and finally sat against the glass with his back to the crowd...Gorillas obviously have a sense of humor. Barb's request was to see the Giant Pandas, so once we finally figured out how to get down there (due to construction, some of the usual access routes are closed), we went down there via Tiger River and Hippo Beach. We actually saw a tiger - it was sleeping. Typical cat. 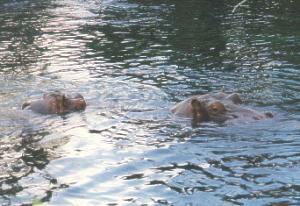 :-) The two hippos were pretty active, though - moving around in the water and sticking their heads out to look around (sometimes all you see of them is their nostrils then they come up for air). Only one of the Pandas was on exhibit (the female, Bai Yun, I believe) and she was, guess what, sleeping. 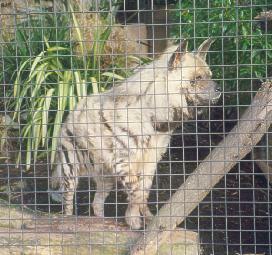 (That's what happens when you visit the Zoo in the afternoon - we usually try to go in the morning instead). We saw the rest of the cats - a beautiful leopard was lounging right up against the front of his cage...we talked to him a little bit and he even opened his eyes and acknowledged our presence. Pretty kitty. 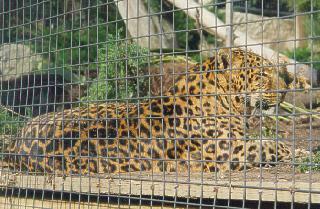 The Brazilian Jaguar was pacing back and forth along the front of his cage - I wouldn't want to meet him on a dark night in the rainforest! The hyenas were quite alert - the keeper was cleaning the cage next to theirs, and I think they knew that it was going to be dinner time for them soon. Up on "Horn and Hoof Mesa" we saw giraffes (who were being quite social and photogenic) and lots of other antelope things - i.e. "prey". 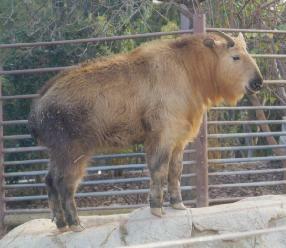 One of the animals we saw is the Takin - a strange-looking critter from China. Looks like a cross between a buffalo, a mountain goat, and a moose. For some reason Polar Bear Plunge is located in this part of the zoo, though it's a far cry from the plains of Africa and Asia to the Arctic! Polar Bear Plunge recreates the Arctic summer tundra, complete with native plants, reindeer, Arctic Foxes, and, of course, Polar Bears. There are 3 or 4 "teenage" polar bears that are usually on exhibit together, and they can be a lot of fun to watch as they frolic in the water and play with a huge ball or other toys. When we got there the adult bear, Bonnie, was the only one out - but we watched her devour a couple piles of carrots, lettuce, and other greens. How's that for exciting behavior? :-) It seemed a little odd, but bears ARE omnivorous, and even polar bears don't live on ice flows ALL the time. I still haven't ever seen the Arctic Foxes, though...I'm beginning to think they don't exist. It was late afternoon and we were tired, so we decided to leave the rest of the Zoo for another day (we skipped an awful lot, but since we're members and admission is "free" we don't have to spend an entire day to feel like we're getting our money's worth). After leaving the Zoo we walked over to the Carousel. I'm a fan of carousel horses (I collect miniature carousel animals), and I was delighted to see the variety of creatures on this carousel - like reindeer, a stork, frogs, a giraffe, tiger, merhorse, etc. 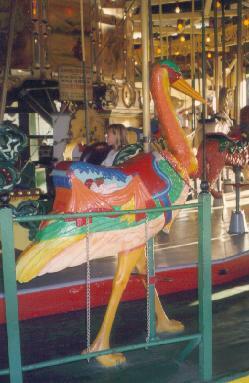 This carousel was built in 1910, and has been in Balboa Park since 1922. And this carousel still offers the brass ring game! 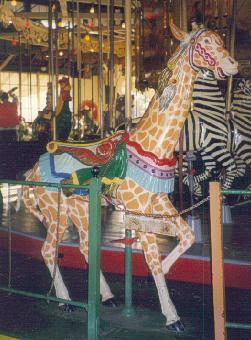 It had been years since I'd ridden this carousel - and the last time I did it I was too small to reach them. Lee and I both got places on the outside (I was on the merhorse), and Barb was on one of the inner horses - those are the ones that go up and down, while the outer ones are stationary. The carousel spun a lot faster than I expected - there was quite a bit of centrifugal (or is that centripetal?) force. Lee got 3 rings and I got two, but they were all iron instead of brass, so no free ride for us. It was a lot of fun, and the ride was also fairly long - about 5 minutes. That concluded our day in the park and we somewhat wearily made our way back to the car and drove home - stopping to pick up an early dinner at a couple of our favorite places (Mexican food for Lee, Thai for Barb and me). Laura and Lee's Zoological Venture - a visit to the Zoo in March 1998. Tigger's Zany Zooventure - March 1998. 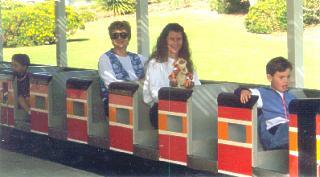 Laura and Lee's African Safari - our visit to the Wild Animal Park in June, 1997. 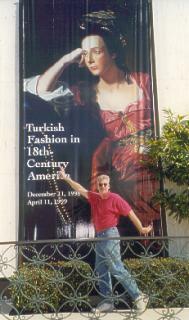 Text and photographs copyright © 1999, by Laura Gilbreath. Feel free to link to this document, but you may not redistribute it in any form without the express written consent of the copyright holder.